Some great local products come together for this salad, which included haricot verts, heirloom carrots prepared sous vide, pickled radish, golden beets, pea tendrils and petit greens from Lucky Leaf Garden tossed with a honey-thyme vinaigrette and served in a potato basket for added texture. The potato basket can be a bit tedious but is a great way to bring a salad off the plate and add crunch to a dish. I use a turning slicer to slice Idaho potatoes, then wrap the potato around the end of a zucchini. I hold the zucchini in a deep fryer at 350 degrees until the potatoes reach a nice golden brown, then remove and let sit for about a minute. Once it has cooled a bit, the potato can be turned and gently removed from the zucchini before seasoning and holding for service. 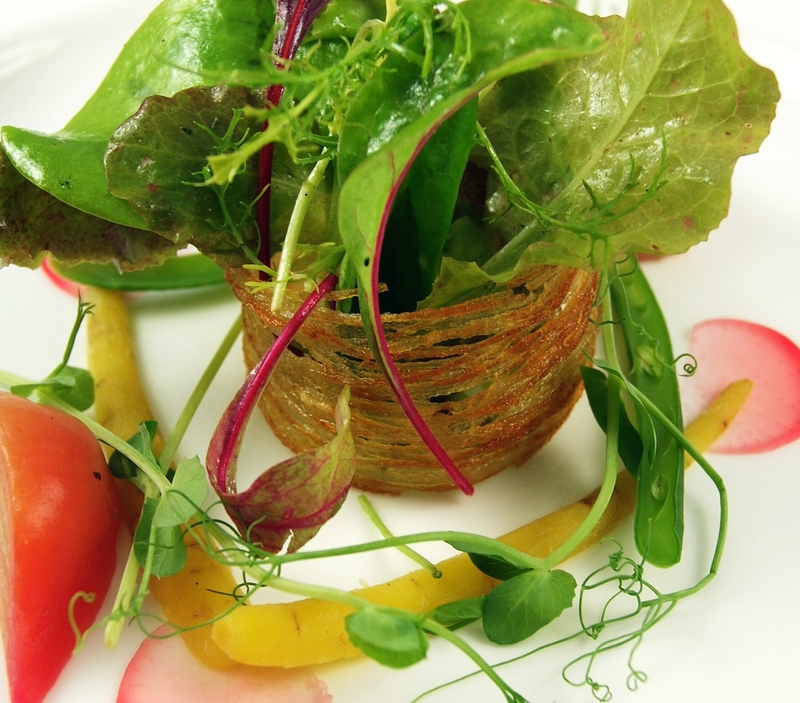 Posted in Appetizer, Salad, Summer, VegetableTagged baby greens, potato crisp, potato ring, summerBookmark the permalink.